Former Secretary of State Hillary Clinton has been under siege for months as additional revelations and developments regarding her use of a private email account continue to drip out. Last week, the Crystal Ball explored what might happen should Clinton drop out of the Democratic primary or, as the rumors swirl about the possibility, if Vice President Joe Biden enters the race. But if Clinton is scarred but undeterred by the email scandal heading into the Iowa caucuses, what we know so far about the primary and caucus schedule suggests that Clinton should still be a favorite, even if Biden does get into the race, though that development would undoubtedly muddy the waters. The principal reason for Clinton’s continued polling edge in the face of her email struggles is her consistently overwhelming support among nonwhite voters. In Fox News’ latest poll, Clinton only led Sen. Bernie Sanders (VT) by 19 points, 49%-30% (with Biden at 10%). However, she earned the backing of 65% of nonwhite Democrats to Sanders’ 14% and Biden’s 12%. When it’s been reported in surveys, Clinton has often been at over 60% among minority Democrats. As long as Clinton remains at near parity in the white vote (among whites she trailed Sanders by six in the Fox poll but led by 12 in CNN’s newest survey), her strength among nonwhites should buoy her in a number of states. Consider Map 1 and Table 1, which lay out the nonwhite participation in the 2008 Democratic primary and the 2016 delegate totals from the 50 states, the District of Columbia, and the American territories. Notes: Based on exit/entrance poll data. Estimated data derived from equation based on a simple regression analysis of nonwhite participation in Democratic primaries and the nonwhite share of the Democratic vote in the general election in states that had primary/caucus and general election exit/entrance polls. Estimates for caucus states may exaggerate nonwhite participation because caucuses tend to see much lower turnout as a percentage of a state’s citizen voting-age population, and data show that nonwhite turnout as a whole tends to be lower compared to white turnout in election contests. Utah Democrats used a primary in 2008 but will use a caucus in 2016. Texas Democrats used the “Texas Two-Step” primary and caucus/convention method in 2008 but will use just a primary in 2016. Sources: Delegate totals based on draft state party plans where possible, TheGreenPapers.com for additional data. Notes: This table does not include the Northern Marianas (over 50% nonwhite), which did not send delegates to the 2008 Democratic convention. Percentages may not add up to 100% due to rounding. Nonwhite Democrats played a major role in many 2008 nominating contests. At least 20% of the electorate was nonwhite in 33 state and territorial primaries or caucuses, including 21 that were at least 35% nonwhite. In 2016, it would not be surprising to see a borderline state such as California (48% in the 2008 primary exit poll) move into a higher category as eight years of further demographic change have aged millions of new nonwhite voters around the country into the eligible electorate. If we consider the preliminary delegate situation in 2016, 77% of delegates will come from states and territories that had primary or caucus electorates that were at least 20% nonwhite in 2008, and more than two-fifths (45%) from states that were at least 35%. In light of her solid backing from nonwhite Democrats, all of this bodes well for Clinton. As most know, President Barack Obama capitalized on his strong support from African Americans, particularly in the South, to win a number of important primaries in 2008. But it’s important to remember that Obama was in many ways the perfect foil to Clinton eight years ago as he was able to win huge shares of black voters, who are more likely to support Clinton this time around. The former secretary of state enjoys sky-high favorable ratings among African Americans, which means she’ll be in a position to win some states she lost to Obama by winning a large percentage of black voters, especially in the Deep South. It’s possible that black turnout will fall in some contests because Obama isn’t running this time around, but there’s little question that African-American Democrats will hold great influence over the outcomes of many 2016 primaries. Moreover, it’s sometimes forgotten that Clinton did very well among Latino voters in 2008. Pew Research Center reported that Clinton defeated Obama among Hispanics in 11 of 14 primaries or caucuses where there was sufficient data available regarding the Latino vote. Of the nine Democratic nominating contests where Hispanics made up at least 10% of the electorate, Clinton won all but Illinois, Obama’s home state (and he only won Latinos 50%-49% in the Land of Lincoln). However, Clinton struggled in caucus states in 2008, most of which were and remain very white. Out of 16 caucus states and territories, Clinton only won Nevada and American Samoa. And, just to accentuate her campaign’s difficulties in the caucus states, Obama actually won the delegate battle in the Silver State 14 to 11 despite Clinton’s overall edge in the caucus vote. Sanders, whose rallies have demonstrated an energy that might translate into caucus support, could potentially do well in many 2016 caucus states. 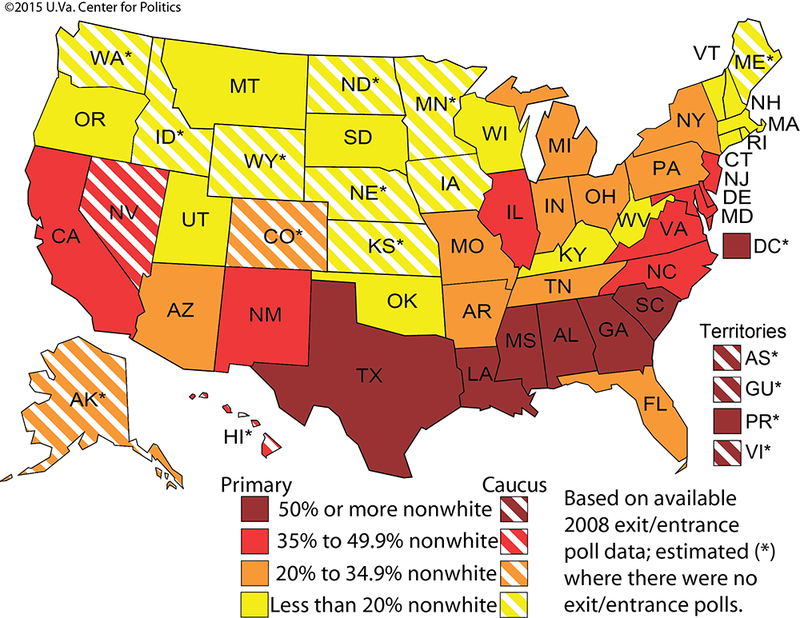 It’s worth noting that, based on our estimates and Nevada’s entrance poll, only four caucus states in 2008 had electorates that were at least 20% nonwhite (though it’s possible Alaska and Colorado didn’t clear that bar, given the very low caucus turnout — see the note in Map 1). But as Table 1 shows, less than a quarter of the delegates will come out of states with 2008 electorates that were less than 20% white. In 2008, Obama combined his big wins in the South, parts of the Midwest, and the caucus states to claim the Democratic nomination. In contrast to Obama, Sanders will be highly unlikely to win numerous Southern primaries if he doesn’t improve his limited support among nonwhite Democrats. As far as American demographics go, many observers have pointed out the fact that Iowa and New Hampshire are notably unrepresentative states. Not only are the Hawkeye and Granite states very white, but they also have large populations of white liberals, many of whom are currently supporting Sanders. So it’s not shocking that Sanders has shown strength in the two leadoff states, particularly in New Hampshire, which abuts his home state of Vermont (Sanders has led Clinton in the two most recent polls of the Granite State). But after those two states vote, Clinton’s support among nonwhite voters may well prove to be a huge difference maker for the former senator and first lady. Table 2 lists the calendar as of Aug. 27 and denotes the level of nonwhite participation in the 2008 Democratic primaries and caucuses (using the same color scheme as in Map 1). Sources: Primary and caucus dates based on available information as of Aug. 27, 2016, chiefly from Frontloading HQ and TheGreenPapers.com. Delegate totals based on draft state party plans where possible, TheGreenPapers.com for additional data. Notes: No specific data available to list a date for Northern Marianas’ caucus event. *Estimate of nonwhite participation. Though data are lacking to provide estimates, all territorial primaries and caucuses undoubtedly had majority nonwhite participation in 2008 (and will again in 2016). The table does not include Democrats Abroad, which will also send delegates to the Democratic National Convention. Utah Democrats used a primary in 2008 but will use a caucus in 2016. Texas Democrats used the “Texas Two-Step” primary and caucus/convention method in 2008 but will use just a primary in 2016. The electorates of Nevada and South Carolina, which are third and fourth in the primary process, will look nothing like those in Iowa and New Hampshire. The Silver State contest will have one of the larger shares of Latino voters, even with a lower-turnout caucus format. In light of racial political polarization, the Palmetto State will have a majority black Democratic primary electorate. Three days after South Carolina votes (it’ll be a Leap Year in 2016), the “SEC Primary” will occur. Although some non-Southern states will vote that day, most attention will be on major Southern states such as Georgia, North Carolina, Texas, and Virginia. Three states voting on March 1 — Alabama, Georgia, and Texas — will likely have majority nonwhite primary electorates, while North Carolina, Tennessee, and Virginia will probably all have electorates that are at least one-third nonwhite. In fact, of the delegates in the states that have contests up through March 1, 72% will come from states that had at least 20% nonwhite primary and caucus electorates in 2008. These states, among them Arkansas (in some ways still Clinton’s home — she won 70% there in 2008), will be in a position to pledge a fair number of delegates to Clinton, strengthening her as we move deeper into the campaign. It’s true that if Biden enters the race, he will have some appeal among nonwhite voters. But the latest Economist/YouGov survey found that more than 60% of blacks and Hispanics prefer Clinton to be the Democratic nominee in 2016 over Biden or Sanders. Meanwhile, the poll showed white Democrats sharply divided, with Sanders preferred by 38%, Clinton 37%, and Biden 11%. Considering Clinton’s strong support from nonwhite Democrats, it’s even possible that Biden’s entry into the race may weaken Sanders’ campaign as much as Clinton’s. The vice president could grab some of Sanders’ supporters as a new, perhaps more electable “other” option against Clinton, as well as some who currently support Clinton. Given Clinton’s overwhelming appeal among nonwhites and Sanders’ relatively small hold over them in horserace polls, much of Biden’s additional support might actually come from white voters. This would then only further divide white Democrats while nonwhite Democrats may remain predominantly in Clinton’s camp. It’s also worth mentioning — as we did last week — that there are a number of embarrassing episodes where Biden made inappropriate remarks when discussing minority Americans. As long as he isn’t a candidate, those moments will probably remain largely in the background. But should he declare his candidacy, media scrutiny and the attack dogs of other candidates will certainly bring them into the campaign conversation, probably to the detriment of Biden’s support among nonwhite Democrats. Nevertheless, one development could help Biden immensely with nonwhite voters — an endorsement from President Obama. Biden has already earned Obama’s “blessing” to make a 2016 run if the vice president so desires. That doesn’t mean Obama will endorse him in the end, but the president has left open the possibility of backing a Democrat during the primary process. If Obama were to endorse someone, it would be a seismic political event — especially if it wasn’t Clinton. We can’t know what will happen with Clinton’s email scandal or if Biden will enter the race. But there are data that suggest Clinton remains in a relatively strong position because of her seemingly entrenched support among nonwhite Democrats. Most states don’t look like Iowa or New Hampshire demographically, which may buoy Clinton’s nomination chances. After the Hawkeye and Granite states’ contests, the schedule quickly moves into states that Clinton will probably be favored in, assuming she retains the levels of support from nonwhite voters that have mostly stayed with her despite the email affair. What it really comes down to is this: There is no Barack Obama in this cycle’s Democratic field. Neither Joe Biden nor Bernie Sanders are likely to fill that role, and Clinton’s solid support among nonwhite voters may endure even if Biden throws his hat in the ring, positioning her to remain the favorite in the long run.